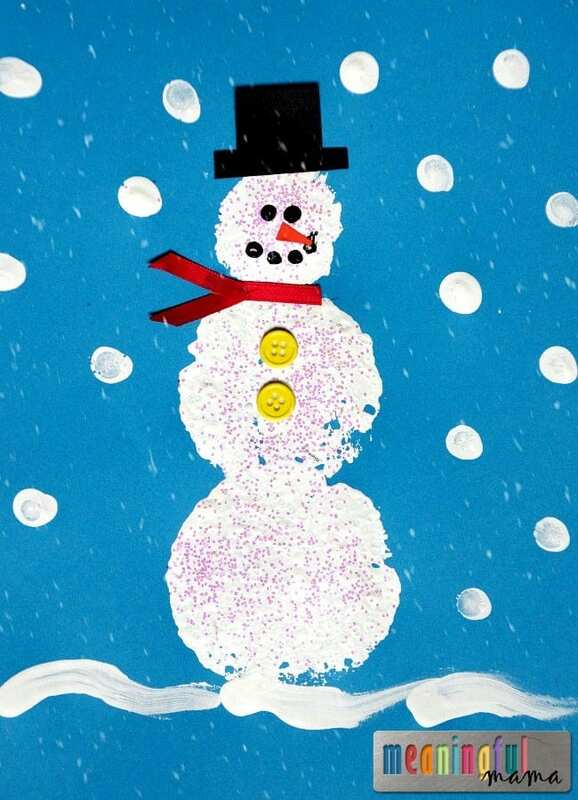 It’s winter, and it is time for a fabulous sponge stamped snowman craft. Do you want to build a snowman? 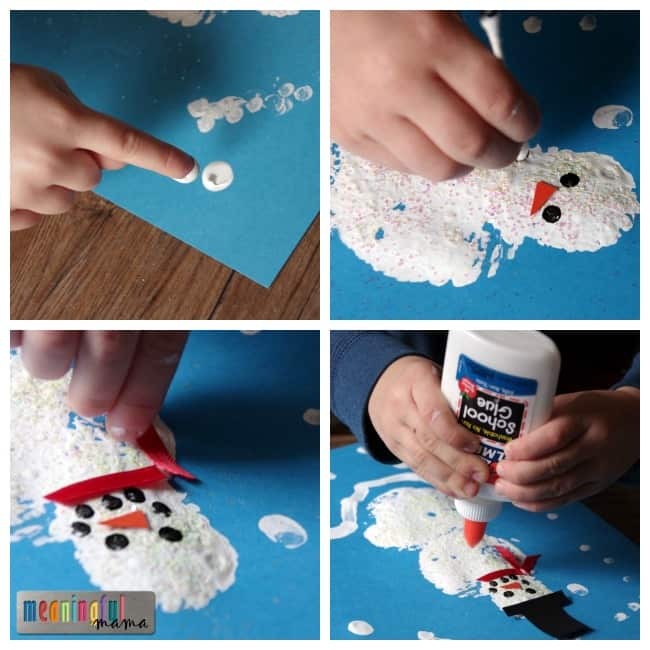 This snowman craft is appropriate for kids age preschool and up. It’s an easy craft that can be done in a classroom with a number of kids or done in your own home. Why not bring the wintery fun from the outside and reflect it in the crafts you do while you are toasty warm on the inside? It’s Christmas break for most, and I thought it would be great to provide you with an activity to keep your kids busy one of these cold afternoons. If you are looking for other snowman ideas, why don’t you give my egg carton snowmen, pointillism snowman or snowman marshmallow dispenser a whirl as well? Using three different size circles templates, use a sharpie to trace the circles onto the sponges. Cut them out. For my templates, I used a mason jar lid and two circle cookie cutters. This part I prepped for the kids. Put white paint onto a plate. 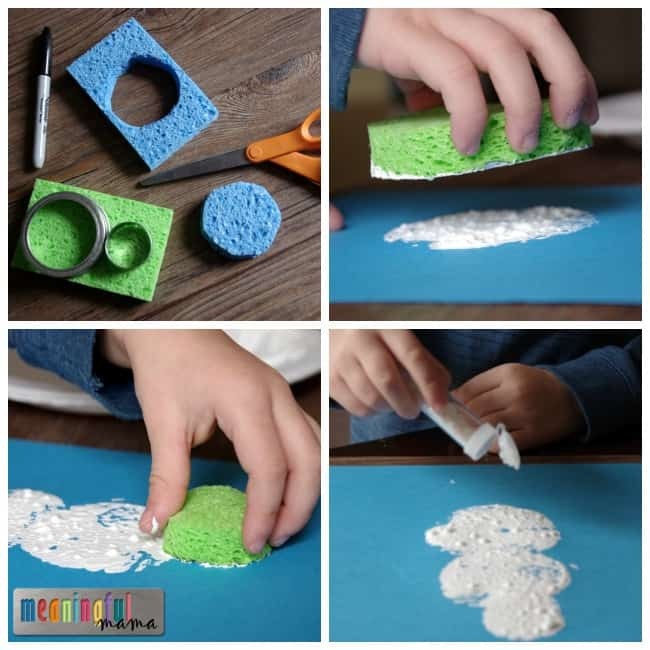 Have kids sponge paint the large, medium, and small circles stacked on top of each other. While wet, have kids shake out white glitter onto the snowman. Have kids use their fingers dipped in white paint to create snowfall. The “flurries” you see in the feature picture are a post-activity picture editing trick, but I’m sure you could create it by doing a splatter paint effect adding some water to the paint to dilute it and then shaking the brush over the paper. It will take a little trial and error to learn how much to dilute it and how to splatter it. Using a Q-Tip and black paint, have the kids add eyes and a mouth. Using glue, have the kids add buttons, ribbon, a cut paper hat and nose. I hope you enjoy this snowman craft with your kids. Have lots of kids in a classroom setting? Make sure to have a few sets of sponge circles for the craft.